Olympic and North Cascade Mountains. Frequent on cliffs and talus slopes usually above 5000’. P. Davidsonii var menziesii is a colonizer as it prefers rocky slopes and cracks with poor soil where few other plants could establish themselves. Aquilegia spp, Cassiope mertensiana, Poa arctica, Vahlodea atropurpurea, Carex nardina, Plox spp, Erigeron humilis. Careful! Alpine plants can be delicate! Needs a sandy, acidic, well drained soil. 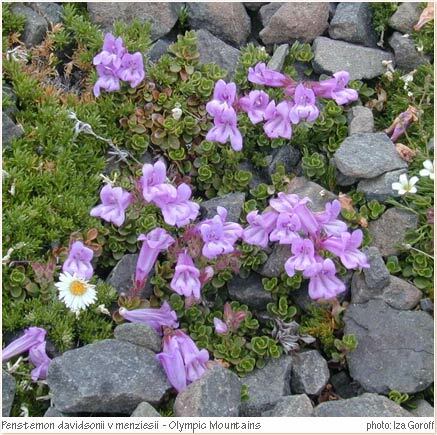 Best if used in a rock garden with other alpine flowering plants. While propagation from seed would be cheaper, the success of transplanting a 1gallon specimen would be better. No more than 16 inches, in perfect conditions P. davidsonii only will reach about a 1 ft diameter. Water weekly, keep pH low.